As the UK/Russia year of culture kicks off, GRAD (Gallery for Russian Arts and Design) has provided a great opportunity to enjoy a collection of striking and colourful Soviet film posters from the 1920s. Co-curated by Elena Sudakova, GRAD director, and film critic/art historian Lutz Becker, the exhibition shows off the designs of brothers Georgii and Vladimir Stenberg, Yakov Ruklevsky, Aleksandr Naumov, Mikhail Dlugach and Nikolai Prusakov. On a cold and damp Tuesday evening in Little Portland Street it was, at first, difficult to put the film posters into the context they deserve. After all, the 1920s was a decade of monumental change and revolutionary zeal in the Soviet Union. The revolution was in its infancy and the country had only recently defeated the White army and counter-revolutionary forces. I think the posters should be seen in this light as far as possible. Credit to GRAD, however, for allowing visitors to imagine their own context. There were no overbearing panels telling us about events in the Soviet Union at the time. This was left to the imagination and I think it works all the better for that. The posters, which were designed by young, ideologically driven artists for Reklam Film (itself an arm of the state-run Sovokino), are presented well with some of the big silent films of the day projected onto the walls alongside. The contrast between the two is striking – the films were, of course, in black and white whilst the posters were bold and colourful. Perhaps this mirrors in some way the Soviet Union at this time. The romantic ideals and values of the revolution, to many very attractive, hid the dark realities of life on the ground. Whatever your take on the politics, the film posters deserve to be seen in their own right as works of exceptional merit. As I left GRAD and turned left down Little Portland Street, I was quickly reminded of the dynamic Soviet film posters – right after a red double-decker bus flashed by with a generic ad for the latest Hollywood movie. 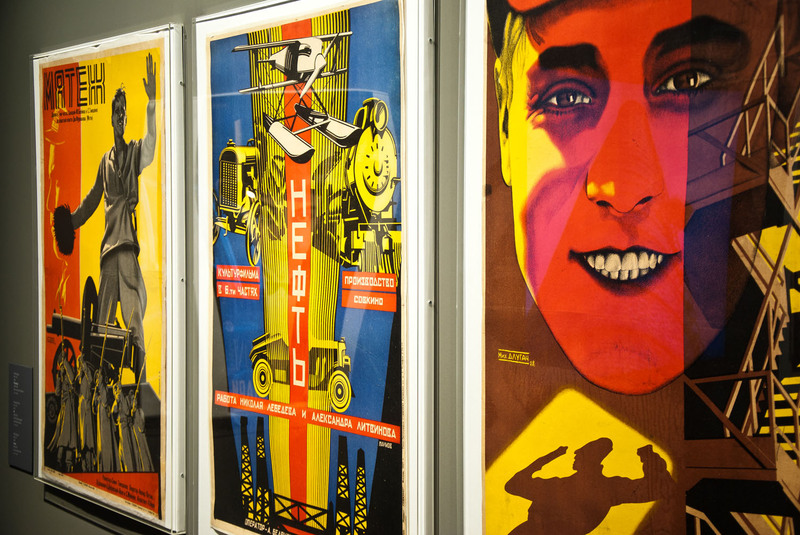 Kino/Film: Soviet Posters of the Silent Screen is on until 29 March, 2014.